Note: Games that have a green light next to them are uploaded and ready to watch. If you don't see a green light, the game isn't uploaded yet (but wil be coming soon). The Steelers trail 21-7 at halftime thanks to a pair of costly fumbles that lead to Baltimore TDs but the Ravens implode in 3rd quarter, turning the ball over 3 times and setting up 17 Steeler points to give Pittsburgh a 24-21 lead. The Ravens ties the game with a late FG but leave 3:54 on the clock, an eternity for Roethlisberger. On the game winning drive, Ben first converts a critical 3rd and 10 with a 12-yd laser to Hines Ward. Then, rather than playing it safe on 3rd and 19 from his own 38 with two minutes to play, Ben uncorks a picture-perfect 58-yd bomb to rookie WR Antonio Brown, who only caught 16 passes during the regular season. Amazingly, Brown gets behind Baltimore's prevent coverage and the pass comes down perfectly to the rookie, who somehow pins the ball against his helmet with one hand before running out of sideline at the Raven 4. Moments later on 3rd and goal, Rashard Mendenhall makes a great cut and slices his way into the end zone for the winning TD. The Ravens get the ball back with 1:27 and a timeout. But Baltimore, who manages only 28 yards of offense in the 2nd half, goes backward on a Flacco sack and on 4th and 18, T.J. Houshmandzadeh drops a pass that would've kept the Ravens alive. The Steelers take over on downs, kneel on the ball twice and move on to the AFC Championship. A special thanks to Keith "Crash" Froehlich for digitizing this game. The Steelers bring down the Jets with an overwhelming show of force in the first half, then hang on to win in the second half en route to their 3rd Super Bowl in 6 years. Pittsburgh sets the tone early with a grinding 15-play, 9-minute opening drive capped by a 1-yd Mendenhall TD plunge. The Steelers soon add a 20-yd Suisham FG after a drive in which all 60 yds come on the ground. On their next possession, the Steelers attack through the air, gaining 58 of their 66 yds passing and taking a 17-0 lead on a 2-yd Roethlisberger high-stepping scoring run at the 2-minute warning. 47 seconds later, Ike Taylor comes on a corner blitz and blindsides Mark Sanchez for a sack, popping a fumble high in the air. 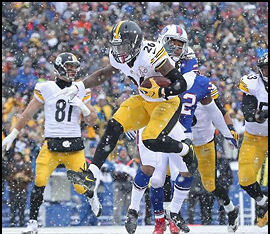 William Gay scoops up the loose ball, picks up several blocks and races 19 yds for a TD and an insurmountable 24-0 Pittsburgh lead. Gang Green fight back in the 2nd half but squander a golden opportunity to make it a one-possession game midway through the 4th quarter, coming up empty after a 17-play, 8 minute drive. On three chances from the 1-yd line, amid confusion on the sidelines and questionable play-calling, the Jets come up empty after Sanchez throws a pair of incompletions before Tomlinson is stuffed on 4th down. On the next play, however, Ben fumbles the snap and is caught for a safety. The Jets draw closer on a Sanchez 4-yd TD pass to Cotchery with 4:32 left. But on 3rd and 6 from the Jet 40, Roethlisberger finds Brown for 14 yds on the most important first down of the night and the Steelers go into victory formation. A special thanks to Keith "Crash" Froehlich for digitizing this game for us.